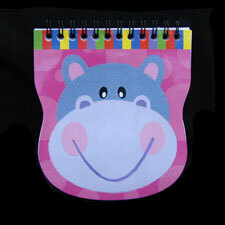 A cute lavender and purple hippo face adorns the front cover of this spiral bound, top flipping notebook. The hippo's face is lightly dusted with sparkly glitter. The notebook has 60 lined sheets (120 pages) and measures 4.5" x 5". This makes for a fun stocking stuffer, child's gift, or token for your favorite hippo collector.